Yesterday at E3 in Los Angeles, I went to Square Enix’s booth for an interview with Final Fantasy XIV director Naoki Yoshida and found him in the middle of a session of his own game. As it turns out, he had been chatting with fans during his interview breaks. And getting mobbed. 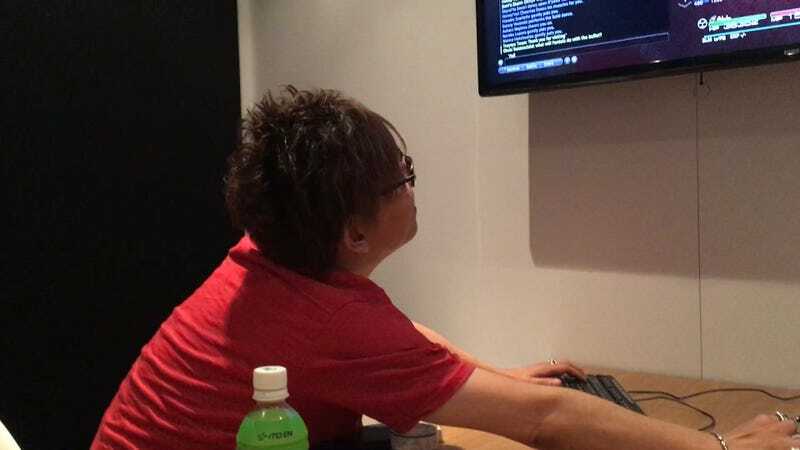 As his team then explained to me, every once in a while, Yoshida will log into his MMORPG on a public account and tell the world that he’s hanging out. Then people will flock to wherever he is, spending hours basking in the presence of the man who helped save Final Fantasy XIV. Yoshida has become a celebrity in the game’s community, not just for his work on the game but for his constant interactions with fans, in frequent streams and blog posts. People love the man. I asked Yoshida how often he plays with strangers who know who he is, and he told me that while his main account is anonymous—and top secret—he sometimes uses his “Yoshida” account to join random groups of players and help them out with tough raids. “A lot of the times people at first think I’m a fake,” he said, speaking through a translator. “But when they start paying attention to the gear, or the movements, they realize they’ve seen this player.” Then they have a story forever.